Denis Shapovalov (/ˌʃɑːpəˈvɑːləv, -ləf/ SHAH-pə-VAH-ləv, -⁠ləf; Hebrew: דניס שפובלוב‎; Russian: Денис Викторович Шаповалов [ʂəpɐˈvaɫəf]; born April 15, 1999) is a Canadian professional tennis player. Shapovalov is currently ranked in the top 20 of the ATP rankings and was the youngest to crack the top 30 since 2005. His career-high ATP singles ranking is No. 20 in the world. He is currently the third youngest player ranked within the ATP top 100, behind compatriot Félix Auger-Aliassime and Serbian Miomir Kecmanović. Shapovalov rose to prominence by reaching a Masters semifinal at the 2017 Canadian Open as an 18-year-old, beating grand slam champions Juan Martín del Potro and Rafael Nadal during his run. He has since reached another Masters semifinal at the 2018 Madrid Open and became the top-ranked Canadian on May 21 as part of his ongoing climb in the ATP rankings. As a junior, Shapovalov reached a career-high ITF junior ranking of No. 2 behind a Wimbledon grand slam singles title in 2016, and a US Open grand slam doubles title with Auger-Aliassime in 2015. Shapovalov was born in Tel Aviv, Israel, the son of Tessa and Viktor Shapovalov. His mother was on the Russian national tennis team, and moved from Russia to Tel Aviv with Denis' father when the Soviet Union was collapsing. She eventually became a tennis coach there. His mother is Jewish, and his father is a Russian Eastern Orthodox Christian. Shapovalov has one sibling, his older brother Evgeniy, who was also born in Israel. The family moved from Israel to Canada before Denis's first birthday. He then lived in Vaughan, Ontario. He started playing tennis at the Richmond Hill Country Club, where his mother got a job as a coach two weeks after arriving in Toronto from Tel Aviv. Denis began playing tennis at age 5, and quickly became obsessed with the game. When it became difficult to get Denis enough time on the Richmond Hill club's courts, his mother left her job there and eventually opened her own tennis academy in Vaughan, named TessaTennis, to help give him a home base to train and to teach the game to other juniors. She is still his coach, along with Martin Laurendeau. Shapovalov attended Stephen Lewis Secondary School in Vaughan. He is nicknamed "Shapo". Shapovalov is fluent in Russian. He gave his first interview in Russian to Russian Eurosport commentators. He now lives in Nassau, Bahamas. He plays for Canada, but holds both Israeli and Canadian citizenships. When Shapovalov was 13, his training needs were too much for his mother to handle on her own. It was at this point that the family hired Adriano Fuorivia, a former manager of tennis development for Tennis Canada, to be his personal coach and travel with Shapovalov while his parents stayed home to run the academy. The relationship between Shapovalov and Adriano lasted four years, and included numerous junior and ITF futures titles, including the 2015 US Open Junior Doubles title and the 2016 Wimbledon Junior Singles title. In October 2013, Shapovalov won his first junior singles title at the ITF G5 in Burlington, Ontario. He captured his second singles title in April 2014 at the ITF G5 in Burlington. In July 2014, Shapovalov won the singles and doubles titles at the ITF G4 in San José. At the US Open in September 2015, he qualified in singles and made it to the third round for his second straight Grand Slam. In doubles, he won the title with partner Félix Auger-Aliassime. In October 2015, Shapovalov and fellow Canadians Félix Auger-Aliassime and Benjamin Sigouin captured the first Junior Davis Cup title for Canada in its history. At the French Open in May 2016, he advanced to the semifinals in singles and to the second round in doubles. At the beginning of July 2016, he captured his first G1 singles title after winning in Roehampton. A week later, Shapovalov became the third Canadian to win a junior Grand Slam singles title with a three-set victory over Alex De Minaur at the 2016 Wimbledon Championships. He also reached the doubles final with Félix Auger-Aliassime. As a junior, he compiled a singles win/loss record of 86–32. In late November 2015, Shapovalov won his first professional doubles title at the ITF Futures in Pensacola. In January 2016, he reached the doubles final at the ITF Futures in Sunrise. A week later, he captured his first professional singles title with a straight-set victory over Pedro Sakamoto at the ITF Futures in Weston. In March 2016, he reached the semifinals of the Challenger Banque Nationale de Drummondville, beating his first top 100 player in Austin Krajicek before losing to Daniel Evans in three sets. In April 2016, Shapovalov won his second and third singles titles after defeating world No. 286 Tennys Sandgren at the ITF 25K in Memphis and winning the ITF 10K in Orange Park over Miomir Kecmanović two weeks later. He also won the doubles title in Orange Park. In July 2016, Shapovalov was awarded a wildcard for the tournament in Washington, his first ATP main draw appearance. He was defeated by Lukáš Lacko in three sets. Shapovalov then was awarded a wildcard for the 2016 Rogers Cup the next week. In the first round he upset world No. 19 Nick Kyrgios, beating him in three sets to win his first tour level match. He was defeated by No. 40 Grigor Dimitrov in straight sets in the next round. In February 2017, Shapovalov was selected to play for the Canada Davis Cup team in the World Group 1st round tie against Great Britain, and lost his opener to Dan Evans. In the deciding rubber against Kyle Edmund, he accidentally hit the chair umpire, Arnaud Gabas, in the eye after launching a ball aimlessly towards the crowd in anger after dropping serve in the opening stages of the third set, leading to immediate disqualification for unsportsmanlike behavior, and as a result, Great Britain won the tie 3–2. In March in Gatineau, Shapovalov captured his fourth ITF Futures singles title after defeating Gleb Sakharov in straight sets. Two weeks later, he won his first ATP Challenger title with a victory over Ruben Bemelmans at the 75K in Drummondville, and was the youngest Canadian to win a Challenger until Félix Auger-Aliassime's victory at the Open Sopra Steria de Lyon later in the year. The next week, he was defeated by Mirza Bašić in the final of the ATP Challenger 50K in Guadalajara, stopping his winning streak at 17 matches. At the French Open in May, his first professional Grand Slam, he was defeated in the first round of qualifying by the first seed Marius Copil in three sets. In June, Shapovalov qualified for the ATP 500 at the Queen's Club Championships, his fourth ATP main draw but his first as a qualifier. In the first round, he defeated his second top 50 player, world No. 47 Kyle Edmund, before losing to world No. 14 Tomáš Berdych. At Wimbledon in July, Shapovalov was awarded a wild card for the main draw. He was defeated by Jerzy Janowicz in the opening round. At the end of the month, he won his second ATP Challenger title, defeating compatriot Peter Polansky in the final of the 75K in Gatineau. Shapovalov experienced a significant breakthrough in August at the Rogers Cup when he defeated world No. 31 Juan Martín del Potro in the second round and world No. 2 Rafael Nadal in the next round, which was his first-ever match against a top 10 player. He went on to defeat world No. 42 Adrian Mannarino in the quarterfinals before bowing out to world No. 8 Alexander Zverev in the semifinals, thus becoming the youngest player ever to reach an ATP World Tour Masters 1000 semifinal. Despite his achievements at the Rogers Cup, Shapovalov had to qualify to enter the main draw of the US Open. In the qualifying rounds, he defeated Denis Kudla, Gastão Elias, and Jan Šátral. In the main draw, Shapovalov defeated Daniil Medvedev in the first round, then No. 8 seed Jo-Wilfried Tsonga in the second. He reached the fourth round by defeating Kyle Edmund in four sets, becoming the youngest player to reach the fourth round since Michael Chang in 1989. He was defeated by world No. 19 Pablo Carreño Busta in the fourth round, after which he reached his career-high ATP ranking of 51. Shapovalov was offered a wild card to the main draw of the Shanghai Masters in October where he lost in the first round to Viktor Troicki in three sets. He also lost in the first round of the Paris Masters two weeks later to Julien Benneteau. In November, Shapovalov competed in the inaugural Next Generation ATP Finals along with seven other top singles players aged 21 and under. Seeded third, Shapovalov finished third in his Group with a record of one win and two losses in round robin play, which was not enough to qualify for the semifinals. Shapovalov began his 2018 season at the Brisbane International, where he lost in the first round in both singles, to Kyle Edmund, and doubles, to eventual winners Henri Kontinen and John Peers. At the ASB Classic, he defeated Rogério Dutra Silva in the opening round but was knocked out in the second round to second seed Juan Martín del Potro in straight sets. At the Australian Open, Shapovalov won his first round match over Stefanos Tsitsipas in straight sets, but lost in the next round to Jo-Wilfried Tsonga in five sets despite leading Tsonga 5–2 in the deciding set. Shapovalov then made his debut at the Delray Beach Open where he reached the semifinals. He defeated Ivo Karlović, Jared Donaldson, and Taylor Fritz in the first three rounds, before falling to eventual champion Frances Tiafoe. The next week at the Mexican Open, Shapovalov defeated former world No. 4 Kei Nishikori in three sets in the first round but lost to world No. 6 Dominic Thiem in the second round. Shapovalov started his March campaign making his debut at Indian Wells, defeating qualifier Ričardas Berankis in the opening round. He lost however to 30th seed Pablo Cuevas in the second round. At the Miami Open, he defeated Viktor Troicki, world No. 30 Damir Džumhur, and world No. 14 Sam Querrey in the first three rounds. He was defeated by Borna Ćorić in the fourth round. Shapovalov started off his maiden clay court season at the Monte-Carlo Masters, where he lost in straight sets to qualifier Stefanos Tsitsipas in the first round. At his second clay court tournament, the Hungarian Open, he once again lost in the first round, this time to Nikoloz Basilashvili. At the Madrid Open, he defeated Tennys Sandgren and Benoît Paire, before knocking out compatriot Milos Raonic to reach the quarterfinals. He then defeated Kyle Edmund to become the youngest semifinalist in Madrid Open history. He subsequently lost in straight sets to world No. 3 and eventual champion Alexander Zverev. Shapovalov's victories here were his first on a clay surface and propelled him to the ATP Top 30 for the first time in his career. He became the youngest top-30 player since Richard Gasquet in 2005. The following week at the Italian Open, Shapovalov beat Tomáš Berdych in three sets and Robin Haase also in three sets to set up a rematch with Rafael Nadal in the third round. With the win over Berdych, he became Canada's new number one in singles. He was defeated by Nadal in straight sets. Shapovalov continued the momentum at the French Open defeating John Millman in straight sets in the first round, but lost to Maximilian Marterer in the next round. Shapovalov next entered the Stuttgart Open, his first tournament of the season on grass, but lost in the first round to qualifier Prajnesh Gunneswaran. The next week at the Queen's Club Championships, he lost again in the opening round this time to Gilles Müller. Despite the struggles, Shapovalov entered the Eastbourne Championships. Seeded third, he defeated Jared Donaldson in his second round matchup only to lose to Mischa Zverev in the quarterfinals. In his first ever appearance at Wimbledon, Shapovalov won his first round match by defeating Jeremy Chardy, but lost to Benoit Paire in the next round after taking the first set 6–0. Shapovalov started the 2018 North American summer hard court swing leading up to the US Open seeded 9th at the Citi Open in Washington, DC, where he defeated Daniil Medvedev before losing to 7th seed Kei Nishikori in the quarterfinals. The following week Shapovalov returned home to Toronto and the Rogers Cup, the tournament where he experienced his 2017 ATP World Tour semifinal breakthrough. Shapovalov handily defeated Jeremy Chardy and fiery Italian Fabio Fognini in straight sets, before being knocked out of his home tournament in the Round of 16 by Robin Haase. 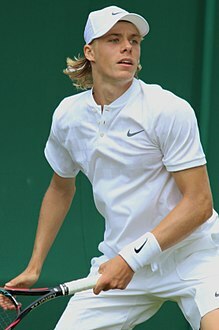 In his first appearance at the Cincinnati Masters on August 13, Shapovalov defeated fellow NextGen ATP up and comer Frances Tiafoe and frequent opponent Kyle Edmund, before going down in the Round of 16 to fellow countryman Milos Raonic, who avenged his loss to Shapovalov during their maiden meeting at the Madrid Open in May. In his second US Open appearance, 28th seed Shapovalov met good friend and fellow Canadian Félix Auger-Aliassime in a highly anticipated first round match-up on a sweltering New York evening. The friends split the first two sets, but in a cruel twist of fate Auger-Aliassime, in his first Grand Slam main draw appearance, was forced to retire from the match in frightening circumstances in the third set. The 18-year old Auger-Aliassime took a medical timeout early in the set, feeling faint and dizzy with a racing heart rate. He played one more game before withdrawing from the match, unable to continue. The pair shared a long embrace at the net following the match, after which Shapovalov encouraged the crowd to applaud Auger-Aliassime and then joined his friend at the sidelines to comfort him. Shapovalov defeated Andreas Seppi in a five set marathon in the next round, but then fell in the Round of 32 to 5th seed Kevin Anderson in a five set thriller that lasted close to four hours. Shapovalov began his 2019 season at the Auckland Open, where seeded seventh, he was defeated by Joao Sousa in three sets. At the Australian Open, he defeated Pablo Andujar and Taro Daniel before being stopped in four sets by six-time and eventual champion Novak Djokovic in their first singles match. His next tournament saw him out in straight sets to Pierre-Hughes Herbert in the quarterfinals. He was also knocked out in the quarterfinals of the Rotterdam Open, but was able to defeat perennial Top-10 player Tomas Berdych before being defeated by former champion Stan Wawrinka. After a dismal opening loss to Mikhail Kukushkin in the Open 13, Shapovalov turned his attention to Indian Wells. He defeated former U.S. Open champion Marin Cilic before being stopped by Hubert Hukacz in the Round of 16. His Miami Open campaign was more fruitful as he was able to defeat fellow NextGen players Stefanos Tsitsipas and Frances Tiafoe on the way to the semifinals. Although he and fellow Canadian Felix Auger-Alissime were semifinalists and had a chance to face off in the finals, both were defeated by veteran champions; Auger-Aliassime by defending champion John Isner, and Shapovalov by eventual champion Roger Federer in their first singles match. This propelled him for the first time to Top 20 in the world. Shapovalov has been coached for many years by his mom, Tessa Shapovalov, but in the fall of 2018 he also brought to his team Rob Steckley. Shapovalov has a 2–8 (20%) record against players who were, at the time the match was played, ranked in the top 10. Singles 5 (decider) Kyle Edmund Loss 3–6, 4–6, 1–2 def. ^ a b "Denis Shapovalov Overview". ATPWorldTour.com. Retrieved July 21, 2017. ^ "The pronunciation by Denis Shapovalov himself". ATP World Tour. Retrieved 17 November 2017. ^ a b "Shapovalov passes Raonic as top-ranked player in Canada". Daily Hive. Retrieved May 16, 2018. ^ a b "Zverev takes #NextGenATP SF clash in Montreal". ATPWorldTour.com. Retrieved August 13, 2017. ^ a b "Shapo beats Berdych, becomes new Canadian No. 1". Tennis Canada. Retrieved May 17, 2018. ^ a b "Denis Shapovalov keeps a small head amid meteoric tennis rise". The Star. Retrieved June 7, 2018. ^ "Junior tennis rising stars: players to watch". Deuce Court. Retrieved October 26, 2016. ^ a b "Canadian junior boys win U.S. Open doubles final". CBC Sports. Retrieved September 13, 2015. ^ a b c "Is Denis Shapovalov the next big thing in Canadian tennis?". The Globe and Mail. ^ Glassman, Marvin (August 14, 2017). "Israeli-born tennis star wears a cross, but his mother considers him 'Jewish'". The Times of Israel. Retrieved June 25, 2018. ^ "Jewish players surprise at Canada's Rogers Cup tennis tourney". Jewish Telegraphic Agency. August 10, 2017. Retrieved June 25, 2018. ^ Glassman, Marvin (March 12, 2018). "Multicultural Israeli teens bond through tennis exhibitions". Sun-Sentinel. Retrieved June 25, 2018. ^ Glassman, Marvin (August 3, 2016). "YOUNG TENNIS STAR SHINES AT ROGERS CUP". Canadian Jewish News. Retrieved June 25, 2018. ^ Eccleshare, Charlie (September 16, 2016). "Rising stars of tennis: Denis Shapovalov confident Junior Wimbledon win will be just the start". The Telegraph. Retrieved August 11, 2017. ^ "Israel-born tennis star shines at the US Open," The Times of Israel. ^ "Israeli tennis coach and Jewish player lead Canada". The Canadian Jewish News. Retrieved July 26, 2016. ^ "Shapovalov the Canadian champion at Wimbledon". ITFTennis.com. Retrieved July 10, 2016. ^ "Q&A with Denis Shapovalov". Merchant of Tennis. Retrieved August 29, 2015. ^ Suppa, Chris (August 29, 2016). "Meet Denis Shapovalov, the GTA's new tennis phenom". Post City Toronto. Retrieved September 18, 2017. ^ Ilya Ryvlin (22 January 2018). "Наши повсюду. Советские корни мирового тенниса" [We are everywhere. Soviet roots in world tennis] (in Russian). Championat.com. Retrieved 2018-01-22. ^ "Шаповалов дал первое в карьере интервью на русском языке" [Shapovalov made his first Russian interview in his career] (in Russian). Championat.com. 15 January 2018. Retrieved 2018-01-22. ^ "Young tennis star shines at Rogers Cup". The Canadian Jewish News. Retrieved March 28, 2018. ^ Lum, Fred. "Is Denis Shapovalov the next big thing in Canadian tennis?". The Globe and Mail. The Globe and Mail. Retrieved 19 January 2018. ^ Cameron, Caroline (8 December 2016). "Canadian tennis phenom Shapovalov looks to take next step with new coach". Sportsnet. Retrieved 19 January 2018. ^ "Drawsheet: Ace Tennis U18 ITF Canadian World Ranking Event 2". ITFTennis.com. Retrieved August 29, 2015. ^ "Drawsheet: 32nd All Canadian Junior Championships". ITFTennis.com. Retrieved August 29, 2015. ^ "Drawsheet: Copa Cariari 2014". ITFTennis.com. Retrieved August 29, 2015. ^ "Czechs and Canadians crowned Junior champions". ITFTennis.com. Retrieved October 5, 2015. ^ "Drawsheet: Roland Garros Junior French Championships". ITFTennis.com. Retrieved June 4, 2016. ^ "Drawsheet: Nike Junior International Roehampton". ITFTennis.com. Retrieved July 1, 2016. ^ "Canadian teen Denis Shapovalov wins boys' Wimbledon title". The Star. Retrieved July 10, 2016. ^ "ITF junior profile – Denis Shapovalov". ITFTennis.com. Retrieved June 7, 2018. ^ "Drawsheet: USA F33 Futures". ITFTennis.com. Retrieved November 22, 2015. ^ "Drawsheet: USA F4 Futures". ITFTennis.com. Retrieved February 1, 2016. ^ "Drawsheet: USA F5 Futures". ITFTennis.com. Retrieved February 1, 2016. ^ "Résultats". ChallengerBanqueNationale.com. Retrieved March 19, 2016. ^ "Drawsheet: USA F12 Futures". ITFTennis.com. Retrieved April 10, 2016. ^ "Drawsheet: USA F14 Futures". ITFTennis.com. Retrieved April 24, 2016. ^ "Lukas Lacko a vaincu Denis Shapovalov en trois manches". RDS.ca. Retrieved July 20, 2016. ^ "Shapovalov stuns Kyrgios in Toronto". ATPWorldTour.com. Retrieved July 26, 2016. ^ "Canada's Milos Raonic moves on, Denis Shapovalov, Vasek Pospisil out at Rogers Cup". Metro News Canada. Retrieved July 27, 2016. ^ a b "Davis Cup drama after Canada's Denis Shapovalov is defaulted for smashing ball into umpire's face to hand Great Britain win". The Telegraph. Retrieved February 5, 2017. ^ "Drawsheet: Canada F1 Futures". ITFTennis.com. Retrieved March 5, 2017. ^ "Shapovalov: youngest Canadian to win Challenger title". Tennis Canada. Retrieved March 19, 2017. ^ "Shapovalov's streak ends in Mexico". Tennis Canada. Retrieved March 27, 2017. ^ "Drawsheet: French Open". ITFTennis.com. Retrieved June 19, 2017. ^ "Shapovalov gets Wimbledon wildcard; falls to Berdych in tough London three setter". Tennis Canada. Retrieved June 28, 2017. ^ "Canadian Denis Shapovalov granted Wimbledon wild-card berth". Sportsnet. Retrieved June 28, 2017. ^ "Canadian Denis Shapovalov out at Wimbledon after losing to Janowicz". Sportsnet. Retrieved July 3, 2017. ^ "#NextGenATP Shapovalov stuns Nadal in Montreal". ATPWorldTour.com. Retrieved August 11, 2017. ^ "The dream continues: Shapovalov makes Montreal SFs". ATPWorldTour.com. Retrieved August 12, 2017. ^ "U.S. Open: Denis Shapovalov gets easy win as injured Edmund retires". CBC Sports. Retrieved September 1, 2017. ^ "U.S. Open: Denis Shapovalov's run comes to an end in round of 16". CBC Sports. Retrieved September 3, 2017. ^ "Shapovalov, Wu get Shanghai wild cards". Tennis.Life. Retrieved October 3, 2017. ^ "Shapovalov falls to Troicki at Shanghai Masters". Sportsnet. Retrieved November 12, 2017. ^ "Pospisil, Shapovalov drop 1st-round matches at Paris Masters". CBC Sports. Retrieved November 12, 2017. ^ "Denis Shapovalov eliminated from Next Gen tournament". CBC Sports. Retrieved November 12, 2017. ^ "Denis Shapovalov drops opening match of 2018". CBC Sports. Retrieved January 15, 2018. ^ "Denis Shapovalov drops second-round match at ASB Classic". Sportsnet. Retrieved January 15, 2018. ^ "Australian Open: Canada's Shapovalov falls in 5 sets to Tsonga". CBC Sports. Retrieved January 17, 2018. ^ "Tiafoe defeats Shapovalov to reach first career final at Delray Beach". Tennis Now. Retrieved March 1, 2018. ^ "Denis Shapovalov falls in 2nd round of Mexico Open". CBC Sports. Retrieved March 1, 2018. ^ "Denis Shapovalov falls to Pablo Cuevas in second round at Indian Wells". Montreal Gazette. Retrieved March 10, 2018. ^ "Miami Open 2018: Shapovalov falls to Coric in three sets". Sporting News. Retrieved March 28, 2018. ^ "Raonic advances, Shapovalov falls at Monte Carlo Masters". CBC Sports. Retrieved April 16, 2018. ^ "Tennis: Defending champion Pouille knocked out of Hungarian Open". Reuters. Retrieved May 12, 2018. ^ "Denis Shapovalov becomes youngest Madrid Open semi-finalist with win against Kyle Edmund". MSN. Retrieved May 14, 2018. ^ "Canada's Shapovalov falls short of Madrid Open final with loss to Zverev". CBC Sports. Retrieved May 12, 2018. ^ "Shapovalov cracks top 30 for first time". MSN. Retrieved May 14, 2018. ^ "Italian Open 2018: Shapovalov overcomes Haase in three sets, moves on to face Nadal". Sporting News. Retrieved May 17, 2018. ^ "Rafael Nadal gains measure of revenge against Denis Shapovalov in Rome". CBC Sports. Retrieved May 18, 2018. ^ "Denis Shapovalov knocked out of French Open". CBC Sports. Retrieved May 31, 2018. ^ "Raonic advances, Shapovalov falls at Stuttgart Open". CBC Sports. Retrieved June 15, 2018. ^ "Denis Shapovalov falls in 1st round at Fever-Tree Championships". CBC Sports. Retrieved June 18, 2018. ^ "Denis Shapovalov advances to Eastbourne International quarter-finals | CBC Sports". CBC. Retrieved 2018-06-28. ^ "Denis Shapovalov, Eugenie Bouchard bounced from Wimbledon with second-round losses". National Post. 2018-07-05. Retrieved 2018-07-06. ^ "Shapovalov defeated in Auckland opener". ESPN.com. 2019-01-07. Retrieved 2019-04-03. ^ "Australian Open 2019: Novak Djokovic beats Denis Shapovalov to advance". 2019-01-19. Retrieved 2019-04-03. ^ "ATP Rotterdam: Stan Wawrinka tops Denis Shapovalov. Kei Nishikori wins". Tennis World USA. Retrieved 2019-04-03. ^ "Federer puts on "tactical" display in win over Shapovalov at Miami". Tennis.com. Retrieved 2019-04-03. ^ "Communication, creativity keys to Shapo-Steckley association". Tennis Life. 15 January 2019. Retrieved 27 March 2019. ^ "Denis Shapovalov – ATP Win/Loss". ATPWorldTour.com. Retrieved March 21, 2018. ^ a b "Shapovalov scoops Most Improved Player of 2017". ATPWorldTour.com. Retrieved November 10, 2017. ^ "Denis Shapovalov named 2017 Tennis Canada Male Player of the Year". Tennis Canada. Retrieved December 6, 2017. ^ "Denis Shapovalov wins Canadian Press male athlete of the year". CBC Sports. Retrieved December 27, 2017. Wikimedia Commons has media related to Denis Shapovalov.